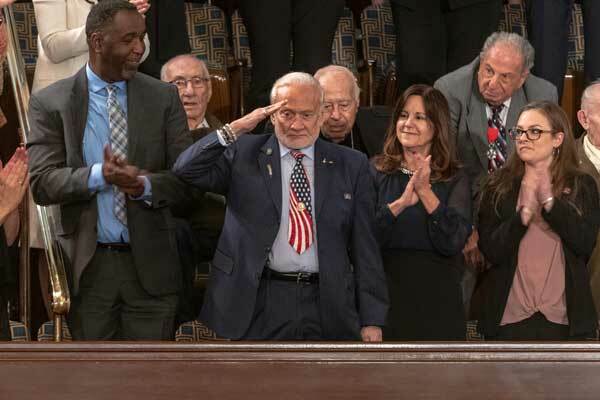 With Apollo 11 astronaut Buzz Aldrin in attendance, President Donald Trump gave a shout out to NASA during the annual State of the Union address. “In 2019, we also celebrate 50 years since brave young pilots flew a quarter of a million miles through space to plant the American flag on the face of the moon. Half a century later, we are joined by one of the Apollo 11 astronauts who planted that flag: Buzz Aldrin. This year, American astronauts will go back to space on American rockets,” he said. NASA’s commercial crew program is set to begin transporting astronauts to the International Space Station later this year. Today, NASA released the following schedule for flight tests of SpaceX’s Crew Dragon and Boeing’s Starliner spacecraft. Looks like NASA is about to get busy with Commercial crew. Hopefully, CONgress/NASA will fund a COTS type prize to get 2-3 companies going with habitats. If we do not do this, then human launch is going to be incredible unsafe.